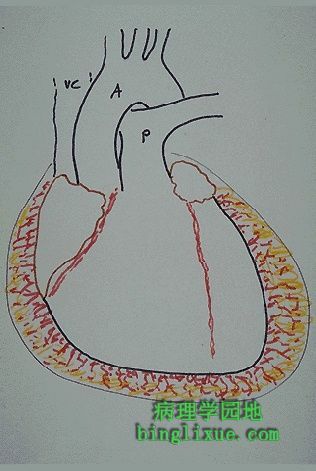 A window of adherent pericardium has been opened to reveal the surface of the heart. 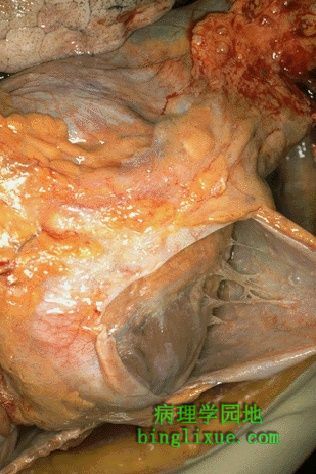 There are thin strands of fibrinous exudate that extend from the epicardial surface to the pericarial sac. This is typical for a fibrinous pericarditis. This is an example of a fibrinous pericarditis. The surface appears roughened from the normal glistening appearance by the strands of pink-tan fibrin. The epicardial surface of the heart shows a shaggy fibrinous exudate. This is another example of fibrinous pericarditis. This appearance has often been called a "bread and butter" pericarditis, but you would have to drop your buttered bread on the carpet to really get this effect. The fibrin often results in the the finding on physical examination of a "friction rub" as the strands of fibrin on epicardium and pericardium rub against each other. Microscopically, the pericardial surface here shows strands of pink fibrin extending outward. There is underlying inflammation. Eventually, the fibrin can be organized and cleared, though sometimes adhesions may remain. The pericarditis here not only has fibrin, but also hemorrhage. 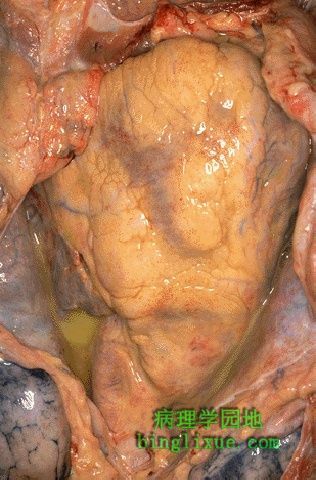 Thus, this is called a "hemorrhagic pericarditis". It is really just fibrinous pericarditis with hemorrhage. 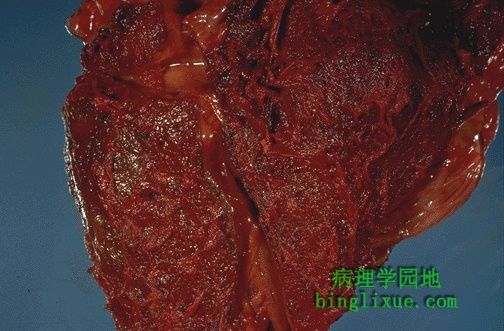 Without inflammation, blood in the pericardial sac would be called "hemopericardium". 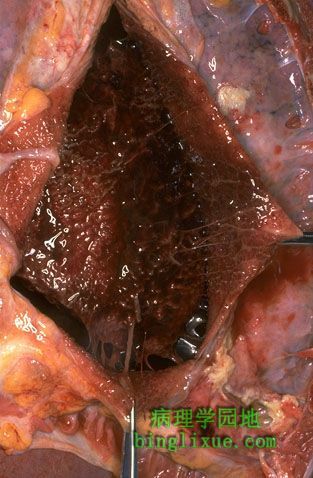 The surface of the heart with hemorrhagic pericarditis demonstrates a roughened and red appearance. 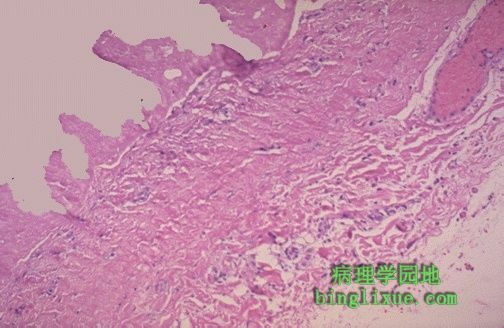 Hemorrhagic pericarditis is most likely to occur with metastatic tumor and with tuberculosis (TB). TB can also lead to a granulomatous pericarditis that may calcify and produce a "constrictive" pericarditis. 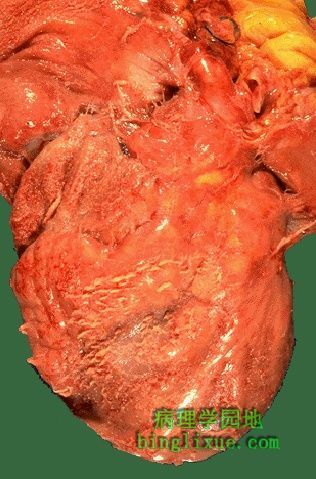 This is a purulent pericarditis. 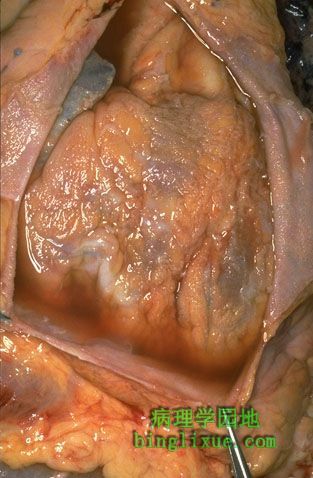 Note the yellowish exudate that has pooled in the lower pericardial sac seen been opened here. 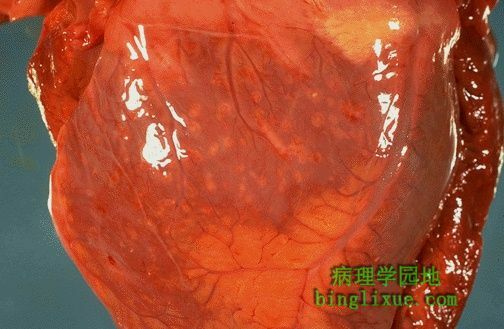 The epicardial surface of the heart is smooth and glistening, but there are small scattered pinpoint yellowish microabscesses. (Higher magnification in next photo). 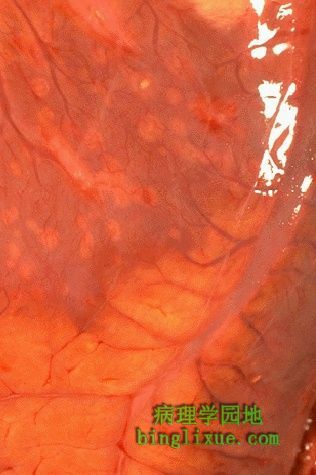 This magnification of the preceding photograph shows the small yellowish pinpoint microabscesses on the epicardial surface. Microabscesses may appear in persons who are septic. They may also represent emboli from an infective endocarditis in which small portions of a vegetation have embolized out the coronary arteries.